I am fairly happy with my bottling from the keg process. It seems like the carbonation level is okay and for the most part I don't usually get any oxidation but I think I can do better. I have gotten notes on some bottles that have some oxidation problems or carb level problems which says to be I am being inconsistant. I am probably not going to buy a beer gun or CPF but in the best Cheap-N-Easy style inspired by Denny I can probably see my way to buy a rubber stopper that fits in my bottles. But what size is that? Currently I stick a bottling wand or piece of tubing on the end of the cobra tap and fill the bottles from the bottom, lifting the tube at the end to make sure I get a complete fill and cap on foam. I was considering putting a tiny bit of sugar syrup in each bottle and doing a hybrid force/natural carb like Sierra Nevada does as well. Thoughts? anyway, any cheap and easy bottling advice welcome. IIRC, it's either a #2 or 2 1/2. I think 2. I am interested to hear what folks have to say, but when I use the cobra tap, I raise the tap/bottle/hose combo higher up in the air (I actually stand on a chair) for a few more feet of rise...this seems (to me, anyway) to reduce foaming/co2 loss (along with cold bottles). I, too, use an old cheapo wing capper I got with my first kit (20 years ago)...no problems. I don't bottle to keep beer, usually just to transport to friends or put into upcoming comps, so I wait until almost the last day to enter/last minute before I leave to bottle. I usually bottle an extra or two and open it on the competition day to see if it is still properly carbonated (and always has been). I don't know the size of the stopper, but it works well for me. I suppose I would need to test a few bottles that have been stored to check for off flavors but most of the bottles don't get stored too long. Are you using oxygen absorbing caps? I bought a bunch just for this reason. And my wing capper works just fine. Sometimes, I'll crimp them twice just to be sure. Since I have several cappers, I'll alternate cappers when I do this. I, too, have thought about adding some sugar for a hybrid bottling method but have not tried it. I would probably use carb tabs or something easy like that, but my experience with those has been hit or miss. All you are doing is increasing the head pressure and reducing the flow rate. You could get similar results by using a longer line or by venting the keg and bottling with low psi. When I bottle (rarely) i vent the keg and then turn the gas on to get a very slow flow. 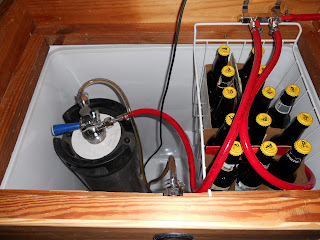 This is what I do as well, I vent the keg and bottle at the lowest pressure that will let beer flow, usually somewhere around 3-4 PSI according to the regulator on the tank. Thanks Denny, That's actually the info I was after but I get verbose sometimes. It's like I just can't stop expounding on my point. You know when you have thoroughly explained what you are trying tos ay but you just seem to keep adding more and more details and/or tangents? It's kind of like when you are talking to someone and you really want them to understand and even though they are nodding their heads as if they already do understand you feel the need to keep explaining and adding more details. Since you live near a shop, why not just take one of your bottles with you and check for fit? Or since they will likely sell bottles too, use one of theirs. Are you buying online? I trust Denny's numbers, but it's good to make sure it fits the way you want it to. Or, you could eye-ball it, make a guess, pick a size, doubt yourself, grab a few different ones just for insurance, and hope that one of them fits the way you like. The others may have a use someday in the future so they should be placed in the tool box. #2. Most definitely a #2. What are you going to do with the stopper? You get a #2 single hole stopper. Run a piece of tubing through it long enough to reach the bottom of the bottle. Put the other end of the tubing into a cobra tap. Seat the stopper in the bottle and open the tap. The bottle will fill a bit, but then the pressure will stop it from filling. Gently crack one side of the stopper with your thumb to resume the flow. When the bottle is full, reseat the stopper, close the tap, remove the stopper and cap the bottle.